For poor households, interventions that help increase their security of wellbeing are received with great expectations, but this depends on their access to resources like land, labour, and savings. Organizations that plan and implement projects focusing on export crops, can tie poor farmers to a dependence on fluctuating world prices over which neither the poor nor the organizations have any control. 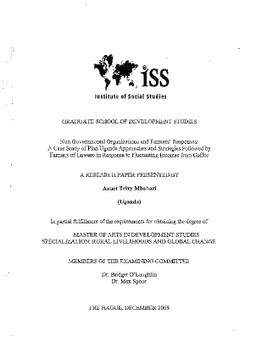 On this account, this paper seeks to assess the fit between approaches of Plan Uganda and the strategies followed by farmers in Luwero District in Uganda. It further seeks to examine if extension schemes based on introduction of new high-yielding varieties of coffee support the strategies followed by Luwero farmers in response to fluctuating prices of coffee. In addition, the study aims to assess if the schemes introduced by the project appeal to a minority of the farmers with sufficient labour and capital, or benefit poor farmers. Lastly it seeks to know if these schemes are responding to the development of new cash cropping alternatives in the District. The study revealed that farmers were actually allocating more resources to other food crops like bananas and 'Plan Uganda' had implemented activities that promoted a number of strategies of the poor farmers. However, challenges in relation to gender analysis and inter-household differences were not exhaustively addressed. There is need for coordination between all stakeholders to promote incentives for quality products in the local markets in order to enable the producers sell their coffee at a premium price, given the fact that coffee is still a major cash crop in the economy of Uganda.